CD reviews: "Gimcracks and Gewgaws" and "Right on My Way Home"
These reviews first appeared in the April 18, 1978 edition of the American Reporter. It's got to be more than karma that has Blue Note releasing new albums by Mose Allison and Bob Dorough within a few months of each other. Surely somebody at the venerable jazz label saw the ... well, rightness, of having two of the most distinctive stylists of the singer/songwriter school hitting the streets at the same time. Fame and fortune haven't graced either to date, although Allison has enjoyed moderate success in jazz circles. 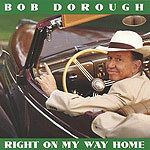 Dorough has remained a cult figure, better known for his songwriting (the jazz standard "I've Got Just About Everything," songs from the Saturday-morning children's TV show "Schoolhouse Rock"). They're both over 70 now, each well into his sixth decade of performing. They're also both at the peak of their skills. Neither was ever a piano powerhouse like Art Tatum or Oscar Peterson, so any slight decline in coordination or dexterity due to age would be irrelevant. What sets these two pianist/singers apart is their style, their sly takes on life. What writer Mitchell Feldman writes of Dorough in his liner notes  that he is "a member of the fraternity of witty songwriters that includes Hoagy Carmichael, Johnny Mercer, Harold Arlen"  applies equally well to Allison. 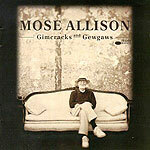 On their new releases, Allison provides us with a full dozen new songs; Dorough contributes three of the ten tracks on his. Their fascination with words has not dimmed; has grown sharper, in fact. Either way, it's safe to say that's one promise you're bound to keep. It's right on my way home. Both are, as mentioned, highly individualistic singers, with high voices and offbeat pacing  although they are similar to each other only in their equal dissimilarity to the norm. (Although pop singer Randy Newman, he of "Short People" fame, was obviously and equally influenced by both men.) So even when they're singing somebody else's song  Dorough handling "Moon River" or Allison on "St. Louis Blues"  it is still done up in their respective inimitable style. They're national resources, Bob Dorough and Mose Allison. The fact that they're not well-known is as much our loss as theirs. The fact that both men continue in good health and creative force into their latter years is a blessing that smart music fans will take advantage of.